Paved over in 1942, what was once one of the biggest rivers in the area now flows under the Miguel Alemán Viaduct, a major east-west highway. Traffic at peak times is so bad that cars average a speed of six kilometers per hour—less than four miles per hour. 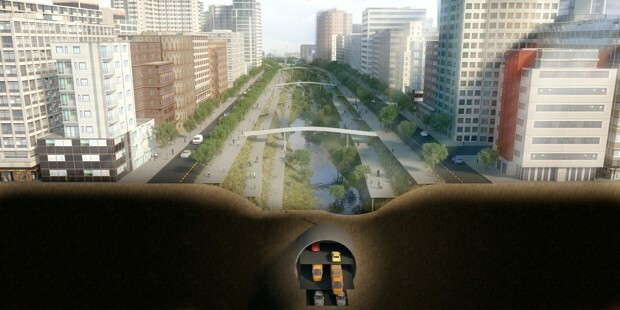 This group of academics, designers, urban planners, environmentalists, and artists have been pushing for seven years to transform Mexico City by rescuing all of the 45 now-covered rivers in the capital’s Anahuac watershed. The first phase would involve uncovering about 9.3 miles of the Piedad River, now part of a drainage network. “It’s not just possible. It’s necessary. The city grew against itself when it encased rivers in pipes and polluted them. We must reconfigure the city for a more symbiotic relationship with the forests and rivers,” says architect Elias Cattan, another Rio Piedad renovation project supporter. Note from Storm: Of all the world’s mega-cities, Mexico City is my favorite. My wife is from DF (“DF”, for “Distrito Federal”, is the equivalent of referring to Washington, DC as “DC”), and we spend at least a month in Mexico every year, usually with at least a few days in Tenochtitlán (the Aztecs’ name for the city they founded). So, I’m very happy to see this proposal to restore the city’s rivers. Water is a magic revitalizer, and Mexico City has a great paucity of water features. That’s probably its single greatest weakness as an urban place. See full article & image credit.